New novel explores immigrant family’s transition to life in new world.. 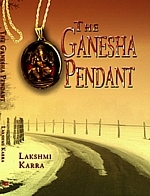 In a candid look at the resolve it takes to leave one’s home, family and everything familiar far behind and start life anew in a place that often seems more than one world away, Lakshmi Karra presents her new book, The Ganesha Pendant (now available through AuthorHouse). In the early 70’s, Indira, a young bride from Andhra Pradesh in South India, migrates to the United States with her husband, Ashok. Indira truly represents a generation of early Indian immigrants who strove to blend the customs and traditions of the east and west. A deep bond is forged between the couple and another immigrant family hailing from the same region. From the initial, immediate culture shock of arriving in her adoptive country to the adjustment of life in a foreign land, readers follow Indira on a journey that spans over two decades. Then in 1997, the friendship, stability and ties to home she had come to depend on are suddenly shattered by an unforeseen incident. Despite a terrible loss, years later the families reconcile with a very touching closure. Nostalgia for the old way of life and vivid imagery bring alive the beautiful rural landscape. Descriptions of the very different social structures of both the countries serve as a backdrop. The novel moves at an easy pace with subtle humor and striking detail. Explanations and a glossary of terms are provided to aid readers’ understanding of this unusual, affecting work.